Travel in comfort and style without the premium price. Luxury Coach Hire for all occasions. All sizes from 16-70 seats. 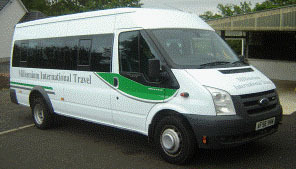 Millennium International operate quality coaches of all sizes from 16 seats up to 70 seats. We are DOE licensed, members of the Federation of Passenger Transport (NI) and supply luxury vehicles for all purposes from days or nights out to quality tours and are international specialists. Please call us for a quotation. We can also handle all aspects of your planned trip, from dining arrangements to accommodation, from your ferry crossing to planning your itinerary. Our top of the range touring coaches are fully fitted, with climate control, and are tri-axle for added comfort and safety. This also gives an increased seating position height for better passenger visibility. Our local uniformed drivers are experienced, friendly and helpful.